Colour Photo into a Black & White Pencil Drawing in Under a Minute! You don´t need to have any artistic skills to create a brilliant pencil drawing any longer! In under 1 Minute, we show you how you can use Image Edit Online to turn any photo into a black and white drawing! In our frames section, you will find a collection of realistic artistic effects. Combined with our image rounder and greyscale filter, you can create an amazing pencil drawing effect from any photo. The video below demonstrates how to upload our photo, round the corners, add a greyscale filter and finalise with the black and white sketch frame. 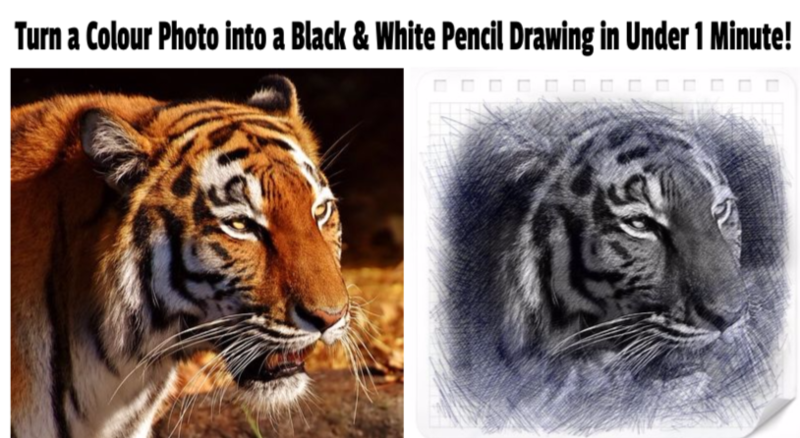 In this tutorial we take a colour photo of a tiger and turn it into a black and white pencil drawing with paper effects. First we upload our photo. If you haven´t already, crop the image to a square. Now navigate to filters and select the “Greyscale” option. We then use our round tool (under the basics tab) to curve the corners. Next we navigate to the stickers section and select our pencil drawing frame. Drag and resize the the pencil drawing frame to cover our photo. Click “Save” to download and admire your work of art!